For years, Alissma has had security defending its borders, be it the Armed Forces of Alissma or the Mandroxan Cartel. Security was founded by Zarthra Zoid, who succeeded in defending Alissma from Minerva Umgee shortly before her downfall. Soon after, Security was taken up by Aylee Stewart with the help of Alicia De'Kova. After the AFA and the Mandroxan Cartel fell from lack of support, security was maintained privately within the body of Alissma. On this day, Alissma's Security Force returns to the public eye. 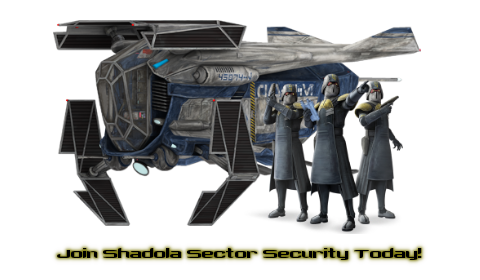 In the far eastern reaches of the galaxy the Shadola system exists, hosting Alissma, Galactic Weapon Systems, and Maldra Mining. Gand, Maldra, and Baummu; sacred systems to Alissma, and Skeebo; the base of commerce and diversity in the sector. Private citizens living their lives, merchant ships and cargo vessels, manufacturers providing for consumers across the galaxy. One agency providing safety and security to them all, Shadola Sector Security. Patrolling the sector, detaining vagrants and criminals, and engaging in space warfare with those who choose to trespass in our part of the galaxy. We are SSS and the safety of the citizens we protect is our mission. SSS exists as a private law enforcement agency based in the Maldra System of the Shadola Sector. We welcome new recruits to become part of the decade old force guarding Alissma's boarders. Services to the public include facility construction and station construction. External security contracts may be negotiable. To arrange access through Shadolan Shields please contact Aylee Stewart or Kuro Neko. Please contact Aylee Stewart or Ran Sode regarding any questions you have about our services, security, or recruitment needs. As long as Alissma is here, we stand with her.